Established in 1915, Attman's Delicatessen has established its reputation as Baltimore's leading delicatessen along "Corned Beef Row" - a unique Baltimore landmark. Today, you will find the same delicious foods, outstanding personnel, and friendly service that has been maintained for over three generations. 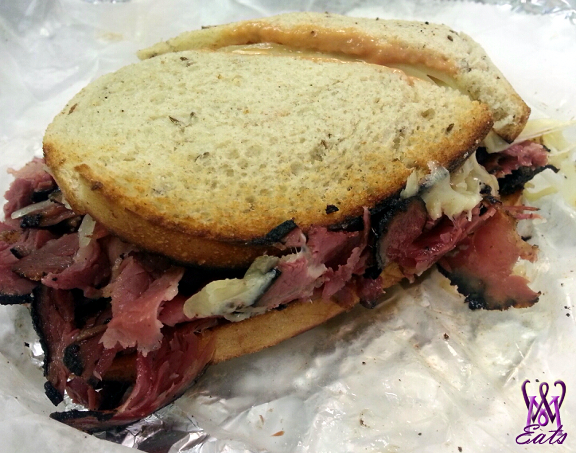 Sit in, take out, or order a party platter from this authentic Jewish deli. 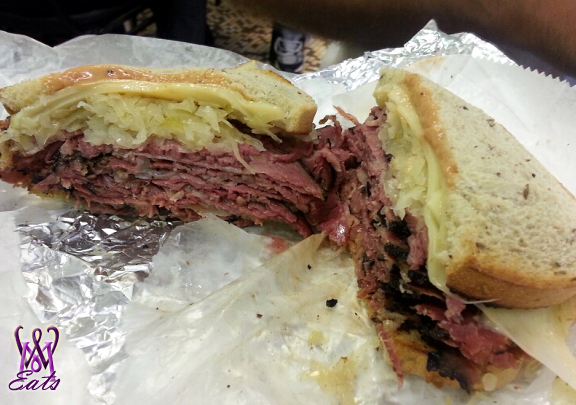 Before catching a Yankees vs. Orioles game, Keith wanted to stop by this deli for lunch. We arrived and a long line had already formed with patrons ranging from old regulars to law enforcement to young hipster kids. They appeared to be a little short staffed today, as the line did not move as quickly as expected. The place is adorned with a plethora of deli signs both hand painted and the neon variety. 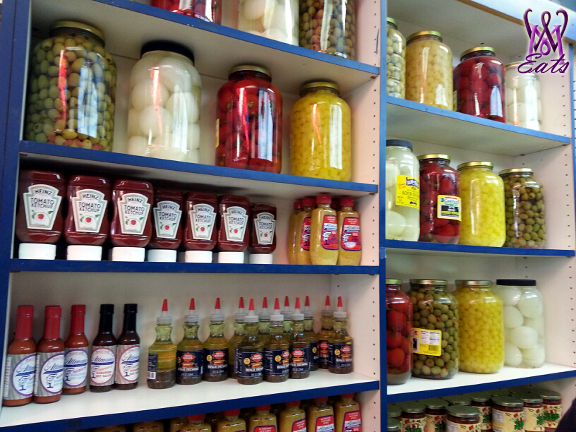 One wall is shelved with pickled jarred products. About 20 minutes after standing in line, we placed our orders, paid, and walked over to the "Kibitz Room" to sit and eat our sandwiches. 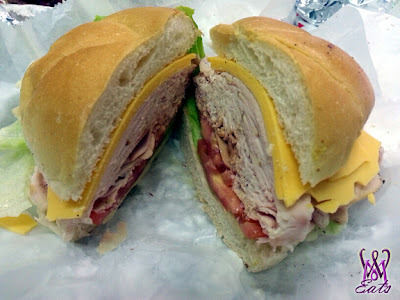 I ordered the Turkey Breast International a specialty sandwich of white meat turkey, choice of cheddar or Swiss, lettuce, tomato and special sauce on a roll. I chose cheddar, but in the rush they put on American cheese instead. The sandwich itself was very good, with a generous portion of meat and fresh ingredients. However, the "special sauce" was a bit lacking and left the sandwich a little dry. Keith ordered the President's Special - hot N.Y. pastrami, sauerkraut and melted Swiss topped with Russian dressing. He loved his sandwich and thought he meat had loads of flavor and was very reminiscent of the kind you find at NY delis. 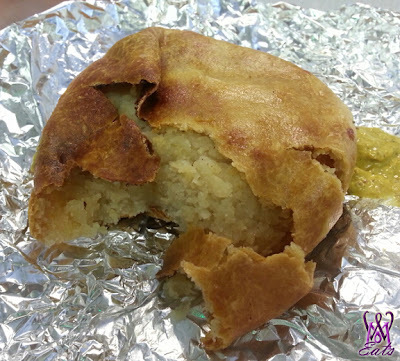 He also ordered a potato knish that was more baked than the traditional fried style you find in NY. The potato stuffing was flavorful, but the pastry dough was a bit thick and had gotten soggy in places. Perhaps it would have been better if they were fresh out of the oven, as opposed to being reheated in the microwave. Overall, Attman's is a "must eat at" spot especially for lunch and during game days. Just prepared to wait in line, although it generally moves fast. Also, call ahead if you want to pick up a party platter or other items by the pound. Free parking is available in a small lot next door, or along the street.